Arab MK suspected of smuggling cellular phones to terrorists claims investigation against him is “a political assassination”. 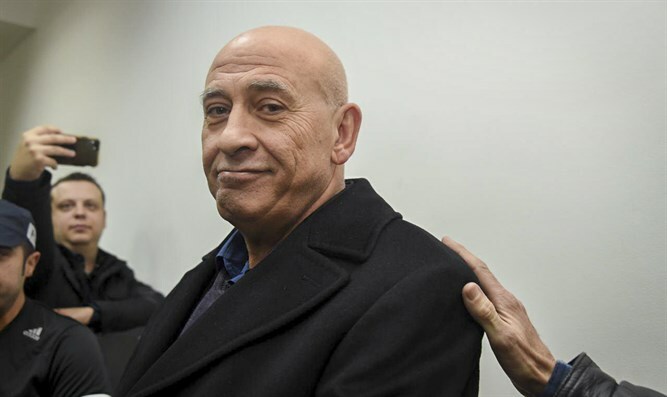 MK Basel Ghattas (Joint List) on Tuesday claimed his arrest and the investigation against him were “a political assassination of an Arab Knesset member”. Ghattas, who is suspected of smuggling cellular phones to terrorists in Israeli prisons, made the comments in an interview with the Al Jazeera news channel, only hours after a judge released him to house arrest. "I see this as part of the political decline occurring in Israel that includes racism and the rise of the right wing and extremist political and religious actors. We are ready for any situation and to pay any price necessary to protect our rights and the rights of our people, in particular, our prisoners," he told Al Jazeera, according to the Jerusalem Online news website. "It was clear from the start that this arrest, in an unprecedented move by the police against an MK, was part of the political measure of this case, accusing an Arab Knesset member that he committed security offense; and I was clear from the start that I did nothing of the sort," continued Ghattas. "As a Knesset Member, my personal relationship with Palestinian prisoners is known. I have been following their problems and visit them in prison. It's an honor of which I am proud of. I did not do the things they say," he claimed. Earlier on Tuesday, Ghattas was released to a house arrest of ten days, despite the police's request to leave him under house arrest for 45 days. According to the conditions of the release, Ghattas will be allowed to take part in Knesset discussions and votes, but he will be under supervision. In addition, he is forbidden from contacting others involved in the case, visiting security prisoners or leaving the country. Also on Tuesday, police arrested the man suspected of giving to Ghattas the mobile phones that he allegedly transferred to jailed Hamas terrorists.